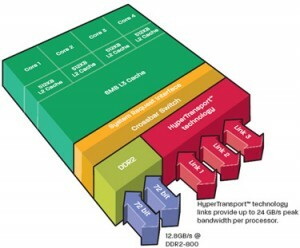 AMD officially announced first Quad Core 45-nm Opteron CPUs code name “Shanghai”. They are not only up to 35% faster than previous line but also consume 35% less power. In addition improvements in virtualization can increase performance up to 40%. They use improved Direct Connect Architecture in conjunction with HyperTransport 3.0 and AMD-V including new Rapid Virtualization Indexing feature. New 45-nm process allowed to increase L3 cache size up to 6M.